A MAN ARRESTED yesterday by detectives in connection with the Omagh bombing remains in custody. The 43-year-old was arrested in the Newry area. 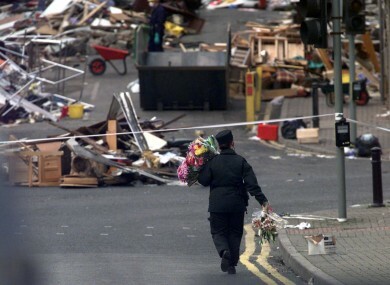 Twenty nine people were killed and 220 people were injured when the Omagh bomb exploded in a parked car on Market Street on 15 August 1998. It detonated at around 3.10pm that afternoon, after being planted in a stolen Vauxhall Cavalier car. A warning had been given by telephone to Ulster Television at 2.32 that day, saying that there was a bomb in the courthouse due to explode in 30 minutes. A minute later, a second warning came saying a bomb would explode in Omagh town within 15 minutes. A minute after this, a call was received by the Samaritans saying a bomb would go off on “main street” about 200 yards from the courthouse. The courthouse was evacuated. No street by the name of “main street” existed in Omagh, but Market St was the town’s main shopping street. The attack came 13 weeks after the Good Friday Agreement was signed and caused international and local outcry. It has been described as one of the worst atrocities of the Troubles. Email “Man arrested in connection with Omagh bombing remains in custody ”. Feedback on “Man arrested in connection with Omagh bombing remains in custody ”.